Dozens of people were injured in the blast, which officials suspect is linked to a wave of recent suicide attacks in Pakistan blamed on pro-Taliban militants angry at President Pervez Mushaharf’s support for the US-led war on terror. 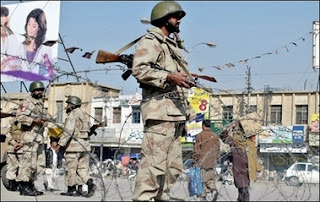 The explosion took place in the compound of district courts, also housing some police offices, in Quetta, capital of Baluchistan province bordering insurgency-plagued southern Afghanistan and Iran. “The bomber entered the courtroom, stood leaning against a wall and detonated,” Baluchistan police chief Tariq Khosa told AFP on Saturday. 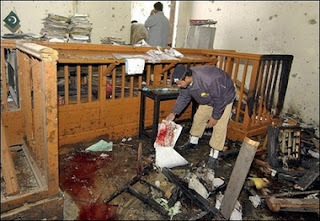 Khosa said Judge Wahid Durrani and several lawyers and court officials were among the dead. “We have found a severed head with a partly undamaged face and we believe it is of the suicide bomber,” Khosa said, adding that forensic experts were working on the scene to collect more evidence. A doctor at Quetta’s main hospital said at least ten of the injured were in a critical condition. “The condition of ten injured is very serious, they have severe burn injuries,” said Ahmed Khan. He added other casualties have suffered multiple broken bones and shrapnel wounds.